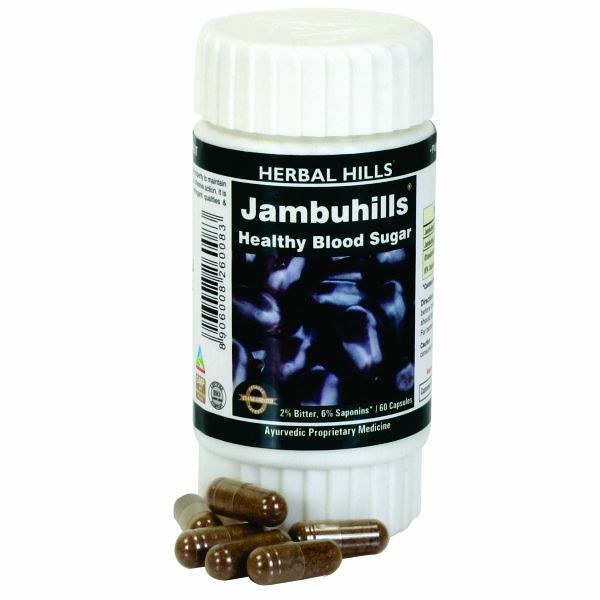 Jambuhills 60 Capsules - Healthy Blood SugarJambubeej is considered to have a natural property to reduce sugar level in blood & urine. It has a cohesive action. - Each capsule contains 175 mg Jambu seed Powder and 250 mg of extract (as dry extract) from Jambu seeds (Eugenia jambolana) (8:1) (equivalent to 2000 mg of Jambu seeds). When assayed these tablets contain Bitter NLT 2%, Saponin 6%. - In Ayurvedic literature Jamun seeds have been mentioned to be useful in Prameha - Diabetes Mellitus. This has been backed by modern scientific literatures & publications. Jamun has been found useful in improving the functions of the pancreas. Astringent property of Jamun helps to bring about Healthy Blood sugar control and also control excessive urination in Diabetes.Benefits : - Helpful in Diabetes Management by its Blood Sugar controlling effects. - Helps in proper functions of the Liver - Safe for Long term use along with modern medicines of Diabetes.